Before the advent of the digital age, Polaroid cameras were considered one of the heights of photography. You take a picture and out comes a copy of that photo for you to see in a few minutes (you allow the chemicals to dry up and set to produce the picture). It was quite a novel gadget that many people got their Polaroids. But with the advent of the digital age, conventional photography slowly but surely took a backseat. Digital cameras gave you instead feedback about the photos you just took, it’s more economical because you don’t have to buy film and a memory card can store hundreds of photos and most digital cameras are quite small and handy. One of the casualties of the shift to digital photography was Polaroid, so much so that Polaroid announced that it would discontinue producing the Polaroid instant films in 2008. 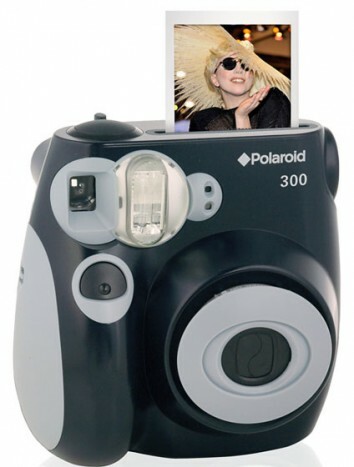 But Polaroid had a change of heart and announced that it will produce instant film cameras once again. The product of that renewed commitment is the Polaroid 300 Instant Analog Camera. The Polaroid 300 Instant Analog Camera brings back all of the nostalgic fun of taking Polaroid photos. But this time, instead of the usual 4R polaroid prints, this camera produces wallet-sized photos that come out from the top of the camera. The camera has been significantly updated with features like auto flash, automatic adjustments, a fast 1/60 shutter speed and also manual exposure compensation. The camera comes in funky blue, red and black colors. The instant film paper has a glossy finish and measures 5.3 cm x 8.5 cm with the image size being 4.5 cm x 6 cm (measured diagonally). It has an ISO of 800 and will be available in packs of ten sheets each.